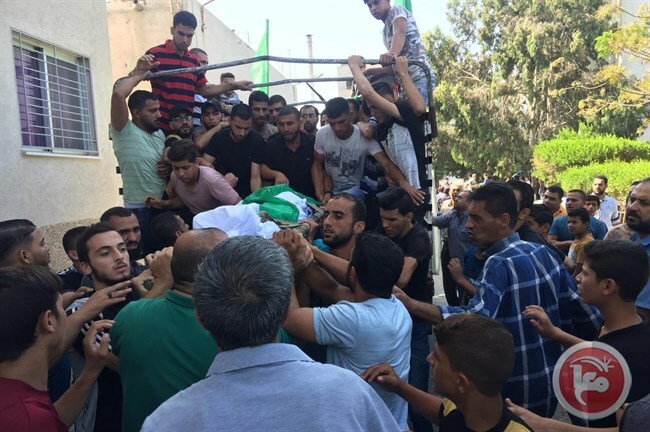 GAZA CITY (Ma’an) — Hundreds of Palestinians of the Gaza Strip marched, on Saturday afternoon, in the funerals of seven Palestinians killed by Israeli forces a day earlier during protests at the eastern borders of the besieged strip. The funerals of Iyad al-Shaer, 18, Muhammad Haniyeh, 23, Muhammad Shakhsa, 25, Muhammad Anshahi, 18, Muhammad al-Awawdeh, 26, and the two children Muhammad al-Hum, 14, and Nasser Musbeh, 12, set off from different areas across the Gaza Strip. Iyad al-Shaer’s cousin, Alaa, held Arab countries responsible “for giving the occupation strength over Palestinians,” through their silence for Israeli crimes against the Palestinian people. 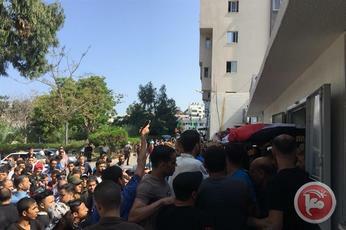 The funerals set off from hospitals towards the homes of each of the seven killed Palestinians before burial processions at local cemeteries. Alongside the killed 7, at least 506 other Palestinians were injured with various wounds, on Friday, 210 of whom were transferred to hospitals for treatment including 3 critical cases. Thirty five children, four women, four paramedics and three journalists were among injuries. Meanwhile, political analyst Naji Zaza said that “The Great March of Return” protests sent clear messages to Israel that these crowds insist on achieving their goals, especially breaking the siege on Gaza.